While the ESPN arena is packed with people supporting Tom "Durrrr" Dwan, he alone feels the full pressure of the moment. Anything less than a victory will be a failure, with pride, history, and supposedly millions of dollars on the line. 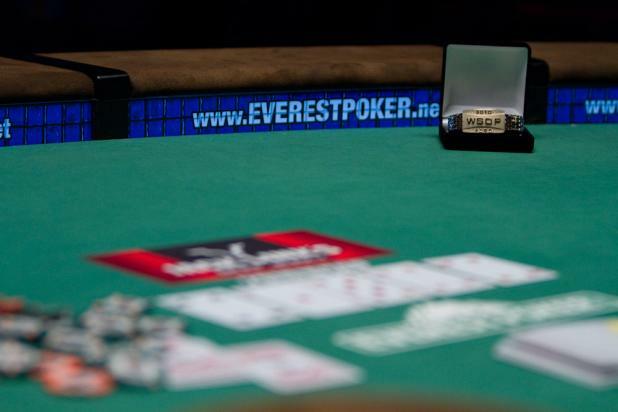 The highest symbol of achievement in the World Series of Poker, the WSOP bracelet is placed on the table for heads-up play. Though in this case, it represents very different things to Simon Watt and Tom "Durrrr" Dwan. 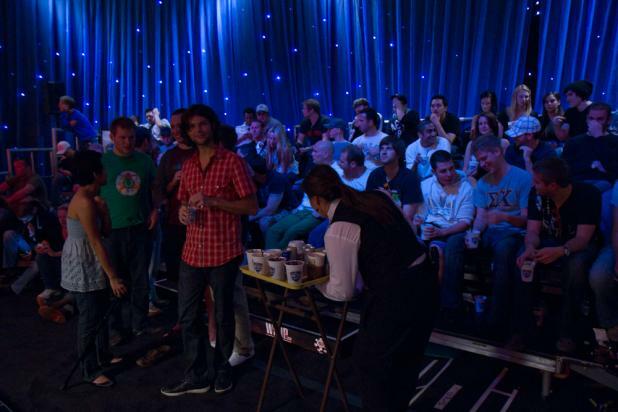 It seemed like all but maybe one or two of the people packing the ESPN arena were on Team Durrrr, rooting for Tom Dwan. Actually, that may not be far from the truth, because when the event was over we learned that Simon Watt only had a single friend from New Zealand in the stands to support him, Joseph Ellis. 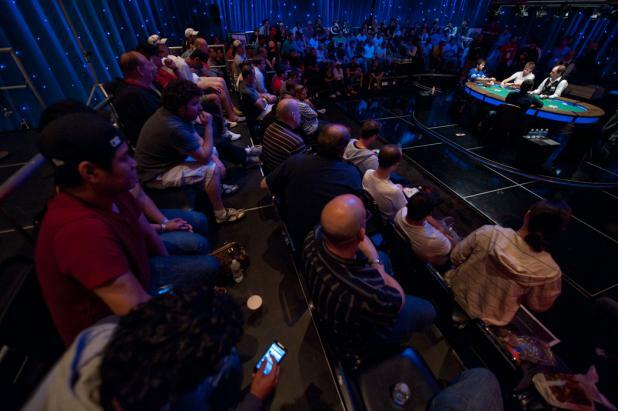 Outside of the ESPN arena it was a different story, as Event #15 ($10,000 Seven Card Stud Hi-Lo) was being played just beyond the bleachers with many of the top pros who had allegedly bet against Dwan. Very few of those players knew anything about Dwan's opponent Simon Watt, but they were rooting very hard for him to win (and collectively save them millions of dollars according to the rumors). 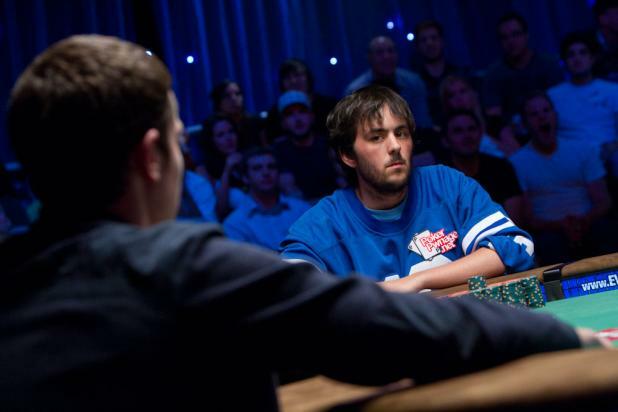 While Simon Watt is playing for a WSOP bracelet and a first prize of $614,248, Tom "Durrrr" Dwan is playing for so much more. 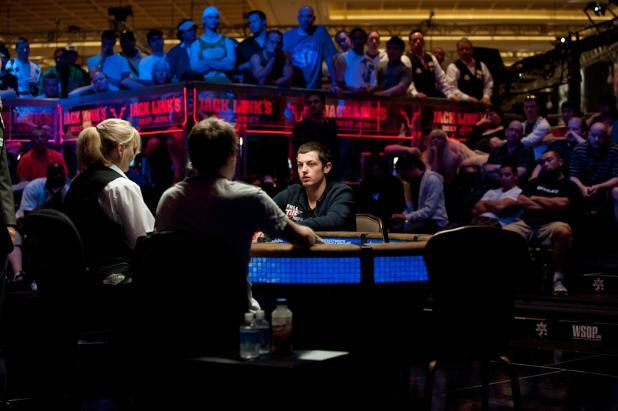 He allegedly made some substantial prop bets before the Series against other high-stakes players, and most of them pay off if he wins his first WSOP bracelet this year. The exact amounts aren't known, but the rumored total is estimated to be close to $10 million. If he doesn't win this event, Dwan would have to settle for second-place money -- $381,885. 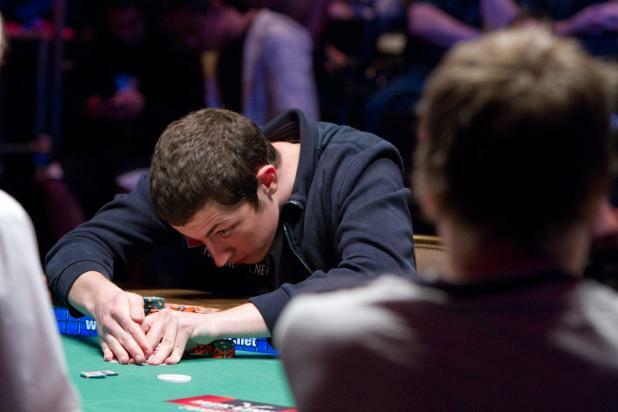 While all of the media attention at the final table has been focused on Tom "Durrrr" Dwan, Simon Watt quietly made his way to the final two. Watt was an unknown in America, as this is his first cash in the U.S., but he won an Asia Pacific Poker Tour (APPT) event in his home country of New Zealand last October. 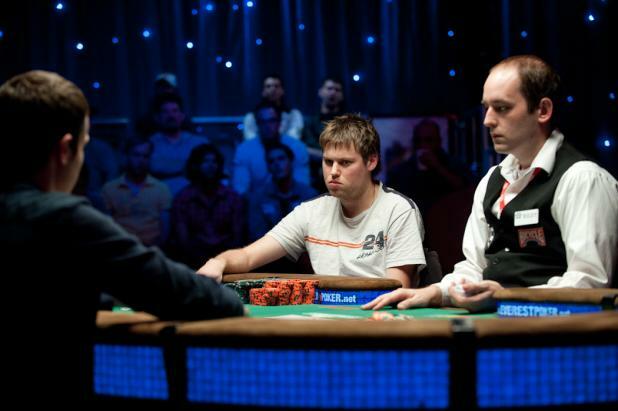 Now, Watt finds himself heads up against a heads-up specialist with a WSOP bracelet on the line. But no matter how good Dwan is, Watt has a chip advantage of more than 2.5-to-1. David "Ghettofabulous" Randall can't fade the luck of the cards, and Simon Watt catches a deuce on the turn to crack Randall's A-K suited with A-2. 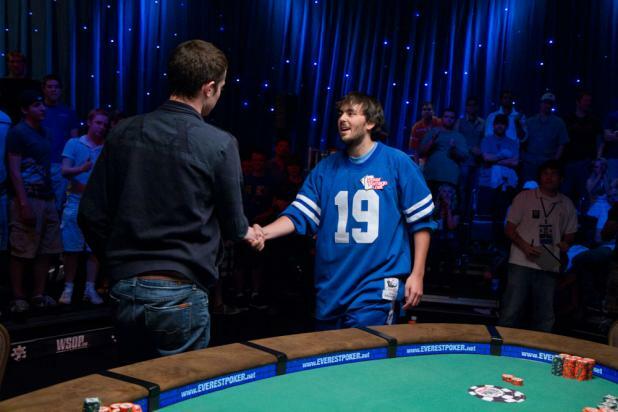 Randall seems to take his third-place finish well, smiling as he shakes the hand of Tom "Durrrr" Dwan. 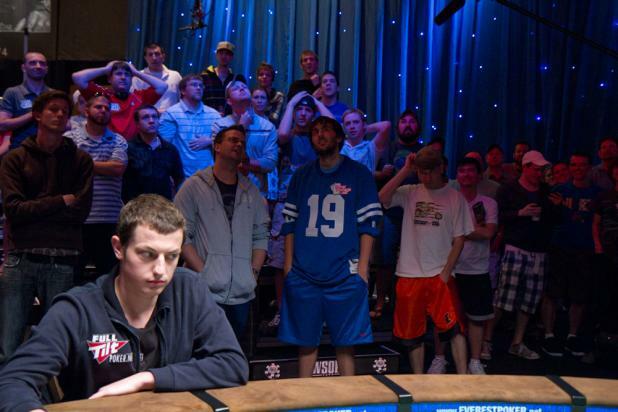 Tom "Durrrr" Dwan (seated, foreground) watches as David "Ghettofabulous" Randall (standing, blue jersey) is all in with A-K suited against Simon Watt's A-2. Randall is a big favorite to double up in the hand. David "Ghettofabulous" Randall continues to study Tom "Durrrr" Dwan in Hand #109, with his tournament life at stake. Randall spends more than five minutes in the tank, and eventually a clock is called. Given one last minute to think, Randall lets the clock run out and forfeits the hand to Dwan. Unfortunately, without the full ESPN crew in place, the hole cards aren't recorded, and we'll never know for sure what cards the two players had. Though he was the chipleader when three-handed play began, Randall is now the short stack at the table. The entire ESPN arena is silent as everyone waits for David Randall to make a decision. 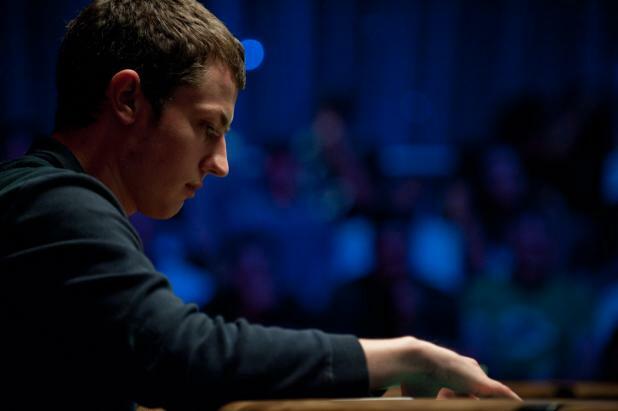 Tom Dwan has moved all in with the board showing Jc-9c-5h-2h-6c. Randall tanks for more than five minutes, alternating between studying the board and studying Dwan.